T&B Arena is used primarily for western classes. It has both an enclosed, heated viewing booth and open air bleacher seating. T&B Arena’s close proximity to T&B Barns makes it an ideal turn out location for horses housed in T&B Barns before or after scheduled classes. 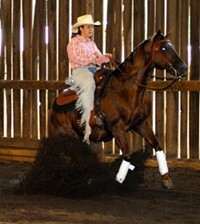 Western students learn to utilize a riding and training system geared towards performance industries like cutting and reining. The development of a balanced, effective seat in the rider is emphasized. The student develops the ability to ride individual western shapes, ride and analyze patterns, and introduce western games to inexperienced horses. The equipment you need to use while riding is often kept in a tack room during off times. Our next stop will be the tack room used by the western students.